Mr. Binitie has over eight years of experience in financing complex real estate transactions. Mr. Binitie has an extensive tax credit financing experience (LIHTC, NMTC and HTC) and has closed on financing from nearly every public capital source available including HOME, HPTF, NSP, CDBG and NIF. Mr. Binitie’s maintains a narrow focus on creatively structuring deals that strive to address the need of his clients, community stakeholders as well as various government agency partners. By narrowly focusing on efficiently financing community development transactions, Mr. Binitie has been successful in adding value beyond the numbers. To date Mr. Binitie and his team are currently managing over $200 million in assets. As Managing Principal of Dantes Partners, Mr. Binitie directs the acquisition, development, management and financial activities of the firm. 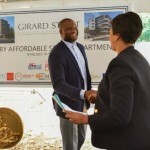 Mr. Binitie’s career is underscored by a commitment to creating and preserving affordable and workforce housing. To this end, Since founding Dantes Partners, Mr. Binitie and his team have closed over $219 million of unconventional real estate transactions that utilize low-income tax credits, new market tax credits, tax-exempt bonds and a various other forms of alternative financing. These efforts have lead to the creation of over 700 units of workforce and affordable housing. Mr. Binitie speaks regularly at industry focused events. Recent engagements include sessions with The Minority Resource, African-American Real Estate Professionals, Biz Now, DC Building Industry Association, Georgetown University, University of Maryland – Colvin Institute of Real Estate Development and the Howard University Real Estate Club.